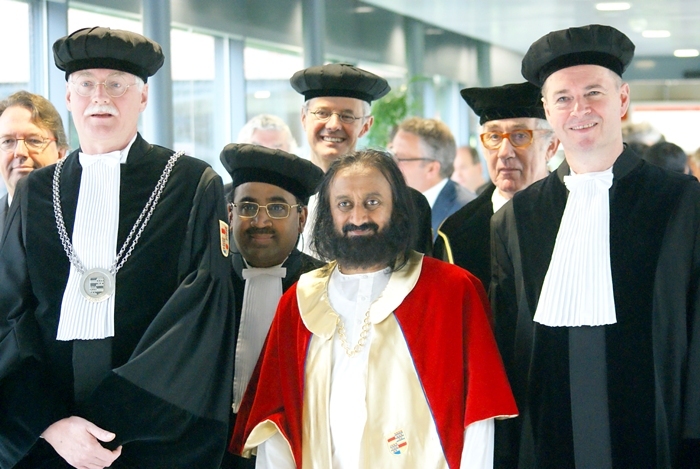 At an impressive ceremony at the prestigious Nyenrode University yesterday morning, Sri Sri Ravi Shankar was conferred with an honorary doctorate. Addressing the gathering , the Rector of Nyenrode, Dr. Maurits van Rooijen FRSA, said that it was a great privilege for the university that Sri Sri has accepted this doctorate. In its 65 years since inception, the university has conferred this doctorate on very few individuals, some of whom include Mr Nelson Mandela, Mr A P J Abdul Kalam and Mr Bill Gates . He added that the work and life of Sri Sri is a true representation of Leadership, Entreprenuership and Stewardship , the 3 core values of the University. The ceremony was attended by several dignitaries including Prof Rudd Lubbers, Former Prime Minister of Netherlands.